← Sometimes you have to leave your babies go! It was mid afternoon and we had been driving through the rural province of Sancti Spíritus in Southern Cuba. Most of the tourists that come to this region head to the world heritage city of Trinidad with its colonial buildings of which some date back to the Spanish conquest of the island. 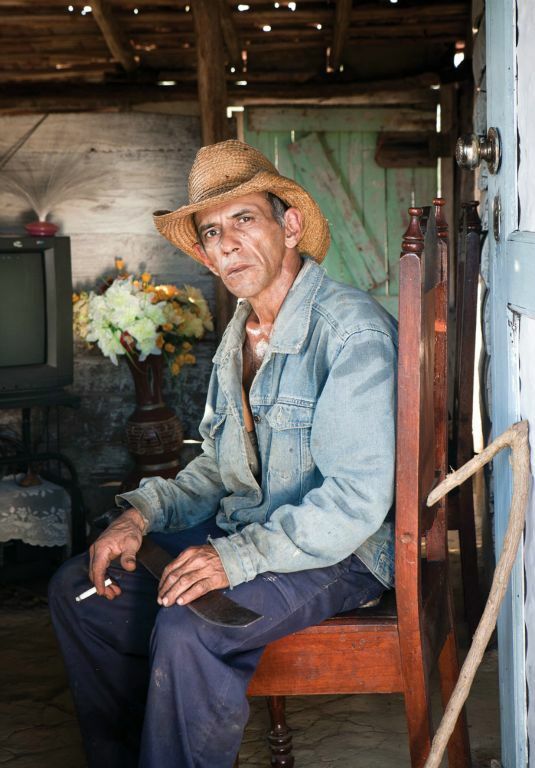 My assistant Orlando and I have no interest in Trinidad as at times it appears like a tourist trap and so we spend our time just driving on the by-roads in the hope of finding someone to make a portrait with. As we drive we come across a house just off the road and decide to stop and see if anyone is at home. The land around the house is flat and appears that it is not arable while in the distance we can see the mountains. We park and walk the short distance to the house. As a point we always leave the camera equipment in the car as we just wish to introduce ourselves and cold calling to someones home can be intimating for some. Marta comes to the door and Orlando speaks to her outlining how we are making portraits and shows her samples of work already completed. Cubans are very friendly and hospitable and Marta invites us in and offer us coffee or water to drink. We spoke for about twenty minutes and she agrees to have her portrait made. After collecting the gear from the car we returned to the house where we met her husband Miquel who had just returned from working in the fields. From a distance he looked like Steve McQueen. dressed in denim jacket, stray hat and rugged good looks. The minute I saw Miquel I knew that I wanted to do a portrait of him but first I had make one of his wife. When I had finished with Marta I then asked Miquel if he would allow me to do portrait and he agreed. As I looked at photographing him on the veranda Miquel just sat down in the doorway of his home and drank water from an aluminium cup and took out his cigarettes. The evening winter light illuminates both him and the interior, he looked so relaxed and for me this was just perfect. He looked very masculine with his machete and wooden gancho stick, the sweat glistened on his skin as he lit his cigarette against a juxtaposition of the feminine lace and flowers of the background. I think this is one of my favorite portraits that I made during this trip, everything just fell right on the day. This entry was posted in art, Arts & Design, cuba, farmer, photography, portfolios, portraits and tagged art, Arts & Design, Cuba, havana, people, portfolios, portraits, travel. Bookmark the permalink.